In 2011, Google released the results of a study that estimated 89% of the clicks from search ads are incremental (89% of visits to an advertiser’s site from ad clicks are not replaced by organic clicks when paid ads are halted). Now, Google is expanding on these findings with further research. In a follow-up study examining 390 cases, Google asked, “How often is an ad impression accompanied by an associated organic result?” The search engine giant found that within the first Google results page, 66% of ad clicks are not associated with related organic results. Also within the first Google results page, they found that 81% of ad impressions are not associated with related organic results. 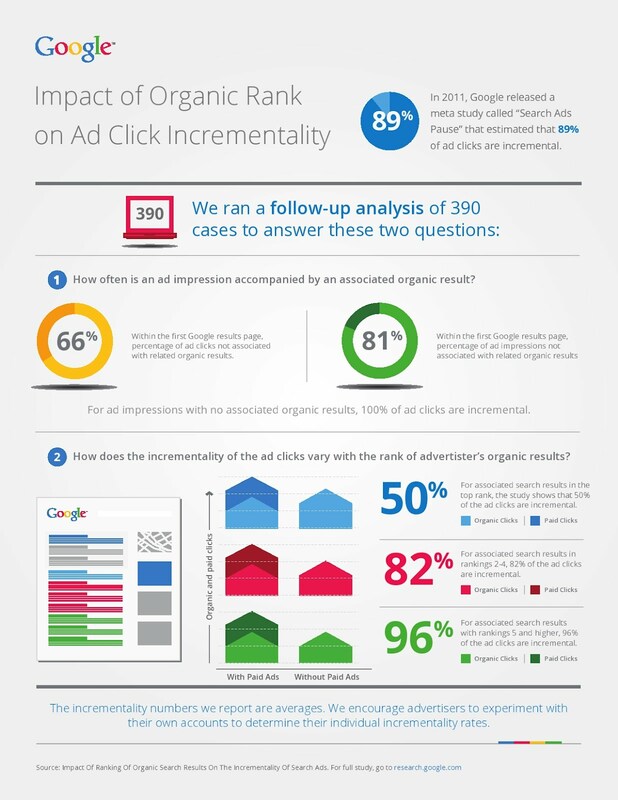 As a result, 100% of ad clicks are incremental for ad impressions with no associated organic results. The study also asked, “How does the incrementality of the ad clicks vary with the rank of the advertiser’s organic results?” Surprisingly, for associated search results in the top rank (i.e. in the #1 spot), 50% of the ad clicks are incremental. For associated search results ranked 2-4, 82% of the ad clicks are incremental, and for results ranked 5+, a whopping 96% of the ad clicks are incremental. Although the Google researchers urge advertisers to experiment with their own paid and organic search strategies to discover what works best for them, the results of the study indicate that ads greatly increase the visibility of advertisers, even those who have a top-ranked presence in organic search. You can view the study infographic in great detail below. What is your reaction to the results of this study? Do you think it will cause you to adjust your paid search strategy? Share your thoughts with us! And if you’re looking to add to your paid media arsenal, check out our detailed write-up on Facebook’s page post ads.